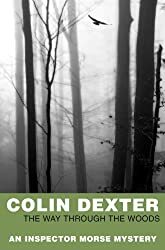 I really enjoyed reading Colin Dexter’s The Way Through The Woods, the tenth book in his Inspector Morse series. It’s nicely complicated and full of puzzles as Morse aided by Sergeant Lewis investigate the case of a beautiful young Swedish tourist who had disappeared on a hot summer’s day somewhere near Oxford twelve months earlier. After unsuccessfully searching the woods of the nearby Blenheim Estate the case was unsolved, and Karin Eriksson had been recorded as a missing person. A year later Morse is on holiday at Lyme Regis when The Times published an article on the missing woman together with an anonymous poem that had been sent in that the police thought could help pinpoint the whereabouts of her body. This sets in motion more letters to The Times and ultimately to Morse being assigned to re-open the case. I was completely engrossed in this book, trying to follow all the possible interpretations of the poem and the witness statements as Morse and Lewis go over the old evidence and turn up new information. This involves a trip to Wales for Morse and one to Sweden for Lewis, Wytham Woods is searched and a body is found – but whose is it? This book sees the first appearance of forensic pathologist, Dr Laura Hobson. But it’s not just the mystery, the crossword type clues, the characterisation and all the twist and turns that make this book so enjoyable, it’s the writing, the descriptions of the scenery and locations bringing them vividly to my mind. This book has been sitting unread on my shelves for three years and is the last of my to-be-read books of 2014. An excellent book! Next Next post: Happy New Year 2015!